1 Department of Internal Medicine, School of Medicine, Federal University of Juiz de Fora (UFJF), Juiz de Fora, MG, Brazil. 2 Department of Psychology, UFJF, Juiz de Fora, MG, Brazil. Background: Psychiatrists’ views on the mind-brain relationship (MBR) have marked clinical and research implications, but there is a lack of studies on this topic. Objectives: To evaluate psychiatrists’ opinions on the MBR, and whether they are amenable to change or not. Methods: We conducted a survey of psychiatrists’ views on the MBR just before and after a debate on the MBR at the Brazilian Congress of Psychiatry in 2014. 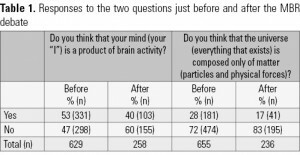 Results: Initially, from more than 600 participants, 53% endorsed the view that “the mind (your “I”) is a product of brain activity”, while 47% disagreed. Moreover, 72% contested the view that “the universe is composed only of matter”. After the debate, 30% changed from a materialist to a non-materialist view of mind, while 17% changed in the opposite way. Discussion: Psychiatrists are interested in debates on the MBR, do not hold a monolithic view on the subject and their positions are open to reflection and change, suggesting the need for more in-depth studies and rigorous but open-minded debates on the subject. Keywords: Mind-brain relationship, psychiatry, opinion, survey, psychiatrists. The mind-body or mind-brain relationship (MBR) is one of the oldest and most challenging philosophical and scientific questions, having marked implications for psychiatry1-4. However, this subject has been poorly discussed in psychiatric literature and training3. Despite all the historical diversity of attempted solutions to the problem, many contemporary debates tend to revolve around two polarized positions, which can be roughly summarized as follows. On the one hand, materialists say, mind is a material or physical process, a product of brain functioning. On the other hand, according to non-materialist views, mind is something different from, and may exist beyond the brain1. Both positions are rooted in a long philosophical tradition, which dates back at least to ancient Greece. For example, while Democritus defended the idea that everything is composed of atoms and that every thought is caused by their physical movements5, Plato insisted that human intellect is immaterial and that the soul survives the death of the body6. This antagonism between physicalism and anti-physicalism has assumed different forms throughout the centuries, being a constant feature of Western thought, and remains alive in contemporary debates7,8. In fact, scientists and philosophers are far from solving the mind-body problem1,8-12. However, despite the lack of consensus among specialists and the persistence of the problem, both academic and lay publications often present the materialist view of mind as an established scientific fact that should be accepted by every educated person, including psychiatrists and scientists in general4,8. This fact poses some problems for the traditional view of science as promoting balanced debates and the free pursuit of rational inquiry, thus contradicting the very scientific spirit one claims to be defending. Moreover, it has implications for clinical and research training in psychiatry, as psychiatrists work depends on certain assumptions on the MBR that they may take for granted without balanced reflection. Views on the MBR are closely related to views and attitudes about human nature in general (e.g., one can assume that we are biological robots determined by our neurons and our genes, that the mind is a fundamental aspect of human being that somehow influences brain and genes, etc. ), free will (e.g., one can believe that patients have control over their thoughts, feelings, symptoms and behavior), the etiology of mental disorders (organic/biological and/or functional/psychological), and treatment options (emphasis on biological and/or psychosocial interventions)2-4. Yet, there has been few studies investigating scientists and clinicians positions regarding the MBR as well as their openness to reflection and change. While surveys with university students and health professionals are scarce13,14, to our knowledge there is none among psychiatrists. The aim of this study is to evaluate psychiatrists’ opinions on the MBR, and whether they are amenable to change or not. We performed a survey of attendees (mostly psychiatrists) of the 2014 Brazilian Congress of Psychiatry that took place in Brasilia (DF), Brazil. As part of the official program, there was a debate titled “What is the relationship between the mind and the brain? Does the brain produce the mind or is it an instrument for the manifestation of the mind?”. Two speakers (both psychiatrists), each defending one general position on the MBR (materialist or non-materialist), were coordinated by a chair (a psychiatrist) in a two-hour debate, including time for questions from the audience. The debate was very well attended (the 600-seat auditorium was packed) and attendees answered the same questions on the MBR and the ultimate nature of the universe (Table 1) immediately before and after the debate, using wireless keypads in an interactive voting system. The audience was split before the debate, with around half endorsing each position on the MBR, and 2/3 endorsing a non-materialist view of the universe (Table 1). 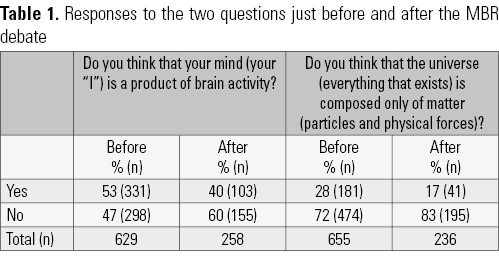 There was also coherence among the answers to both questions: only 6% simultaneously accepted that the mind is not a product of brain activity and the incompatible view that the whole universe is composed only of matter. Besides, materialist views on the MBR did not necessarily imply a materialist view of the universe, as 55% of those believing that the mind is a brain product rejected a purely physical description of the universe. Finally, almost half of the Brazilian psychiatrists endorsed the view that the mind is not a product of brain activity. From the attendees who answered questions before and after the debate, 30% changed their position from a materialist to a non-materialist view of mind, and 17% did in the opposite way; 30% changed from a materialist to a non-materialist view of the universe, and 2% did in the opposite way. The division of Brazilian psychiatrists’ views on the MBR in two halves seems to reflect the academic controversies regarding the mind-brain problem. Our findings lie midway between the views of Scottish university students (67% stated that mind and brain are separate things) and Belgian health professionals (40%)13. The audience was not only interested in the discussion, but also susceptible to reflection and opinion change based on arguments presented during the debate. Studies with US college students found that presenting strong mechanistic explanations of mind increases their acceptance of materialist views of the MBR14,15, and that showing the limits and the explanatory gap in neuroscience increases their acceptance of non-materialist views of mind15. Several attendees came to talk informally to us after the session, and admitted they had never thought deeply on the MBR or even heard many of the arguments presented during the debate. Some told us the debate caused them a deep impression. One limitation of our survey is that not all the attendees were psychiatrists, some probably being medical students or another type of mental health professional. However, since around 85% of the participants were physicians, especially psychiatrists, it is very likely that most of our sample was composed by psychiatrists. Moreover, we had a considerable loss of subjects near the end of the debate. As the entire session lasted two hours and the last part was devoted to audience questions, several people left the room during the last 30 minutes. However, to minimize bias, we only considered opinion change data from those attendees who answered the same questions before and after the debate. Finally, despite the considerable sample size, it is not clear how precisely it represents the positions of Brazilian psychiatrists as a whole. This study has several strengths, though. To our knowledge, it is the first survey of psychiatrists’ views on the MBR and has a large sample collected at the world’s third largest psychiatry conference. Given the technology of the wireless interactive voting system, it was possible not only to access psychiatrists’ position on the MBR, but also to perform a natural experiment on the impact of exposing a large and qualified audience of psychiatrists to presentation and discussion on the two main views on the MBR, something that has never been done before. The present paper found that about half of psychiatrists accepted a materialist and about half a non-materialist view of mind. Seventy-two percent endorsed a non-materialist view of the universe. Our data suggest that psychiatrists are interested in discussions about the MBR, despite the low frequency of such discussions on psychiatric training and literature. It is clear that psychiatrists do not hold a monolithic view on the MBR, and that discussions may foster critical thinking on the subject, leading to opinion consolidation or change. However, in order to foster critical thinking, we need more than simplistic or caricatural presentations of the MBR as if it were a problem already solved, thus opening the debate to different views and the challenges they pose to our scientific understanding of human life. Cloninger CR. The importance of ternary awareness for overcoming the inadequacies of contemporary psychiatry. Rev Psiq Clín. 2013;40(3):110-3. Available from: <http://dx.doi.org/10.1590/S0101-60832013000300006>. Berryman S. Democritus. In: Zalta E, editor. The Stanford Encyclopedia of Philosophy 2010. Available from: <http://plato.stanford.edu/archives/fall2010/entries/democritus/>. Araujo SF. O eterno retorno do materialismo: padrões recorrentes de explicações materialistas dos fenômenos mentais. Rev Psiq Clín. 2013;40(3):114-9. Available from: <http://dx.doi.org/10.1590/S0101-60832013000300007>. Araujo SF. Searle’s new mystery, or, how not to solve the problem of consciousness. Rivista Internazionale di Filosofia e Psicologia. 2013; 4(1):1-12. Demertzi A, Liew C, Ledoux D, Bruno MA, Sharpe M, Laureys S, et al. Dualism persists in the science of mind. Ann N Y Acad Sci. 2009;1157:1-9. Available from: <http://dx.doi.org/10.1111/j.1749-6632.2008.04117.x>. Harrington IA. Can you change a student’s mind in a course about the brain? Belief change following an introductory course in biological psychology. J Undergrad Neurosci Educ. 2013;12(1):A23-33. Available from: <http://www.ncbi.nlm.nih.gov/pmc/articles/PMC3852867/>. Preston JL, Ritter RS, Hepler J. Neuroscience and the soul: competing explanations for the human experience. Cognition. 2013;127(1):31-7. Available from: <http://dx.doi.org/10.1016/j.cognition.2012.12.003>.